perfectly fit to appear in newspapers from coast to coast, and for their collected volumes to be shelved in school libraries. Larson got his start in cartooning during a late 1970s soul-searching session, in which he concluded that making funny drawings was better than what he was then doing for a living. He got lucky right away, when six of his cartoons were accepted by a local magazine, which paid $15 each for them. After a few other small successes, he landed a gig at The Seattle Times, producing a weekly panel called Nature's Way, which ran next to a puzzle aimed at children. It took them almost a year to realize Larson's cartoons weren't the sort of thing parents like to see in a slot like that. He was fired the day before his greatest success to date — Stanleigh Arnold of The San Francisco Chronicle thought Larson's stuff was funny enough to make a daily series; and what's more, the Chronicle would syndicate it nationally. 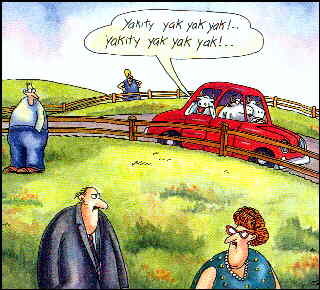 The Far Side started in the Chronicle on January 1, 1980. Within a few months, other papers started picking it up. Gradually, Larson's cows, mad scientists, disgusting insects, amoebae, ducks, etc. became known to millions — as did Larson's rather unusual style of humor. Before long, other cartoonists, such as Dan Piraro (Bizarro) and Buddy Hickerson (Quigmans), were taking cues from him. In 1982, Andrews and McMeel brought out the first of many Far Side collections — all of which number their sales in the millions. Far Side cartoons were soon appearing on posters, calendars, greeting cards and many other kinds of licensed merchandise — to say nothing of refrigerator doors and bulletin boards all over the world. Five years after starting with Chronicle Features (The Chronicle's syndication arm), Larson moved to the much larger Universal Press Syndicate, distributor of Nancy, Li'l Abner, The Captain & the Kids, and many other newspaper comics. Larson's work has been hung in museums — at least one of which was devoted to science, not art. In 1985, a species of disgusting insect was named Strigiphilus garylarsoni in his honor. Larson won The Reuben Award, given by The National Cartoonists' Society to the Cartoonist of the Year, in 1990 and again in 1994. Also in 1994, The Far Side established a beachhead in prime-time television, with the broadcast of its Halloween special. Eventually, Larson reached a point where he no longer had to deal with the grind of turning out something publishable every day. In the late 1980s, he followed the lead of Doonesbury's Garry Trudeau, and took a sabbatical. His syndicate sent out reruns while he stewed in his creative juices for 14 months. Tho he came back refreshed, a few years later he decided he'd done enough dealing with daily deadlines, and ended his feature at the height of its popularity. The last one appeared in newspapers December 31, 1994. Since then, the coffee mugs, T-shirts, etc. have still been available — and still popular, tho they no longer have a daily feature fueling interest. The Halloween Special has been seen from time to time. Larson's books remain in print, and still enjoy healthy sales. Larson himself, however, is pursuing other interests. The public seldom hears about his current doings. Text ©2001-05 Donald D. Markstein. Art © Universal Press Syndicate.